The undefeated San Diego Enforcers are a win away from clinching their third appearance in the NPSFL National Championship, where they would visit the Eastern Division champion Charlotte Cobras on Saturday, June 2oth. Standing in their way are the Los Angeles Centurions, who are made up of members of the Los Angeles Police Department. The longtime nemesis of the Enforcers will not only be looking to play spoiler, but try to earn their first championship appearance since 2011. Last season the Enforcers extended their winning streak over the Centurions to five games after a hard fought 22-16 victory in Los Angeles. The Enforcers trailed 16-7 before putting up 15 unanswered points. A 25-yard touchdown run by Jahir Waterman sealed the win. "We really enjoy the rivalry," Enforcers head coach Brain Salmon said. "We want to play this game every year." 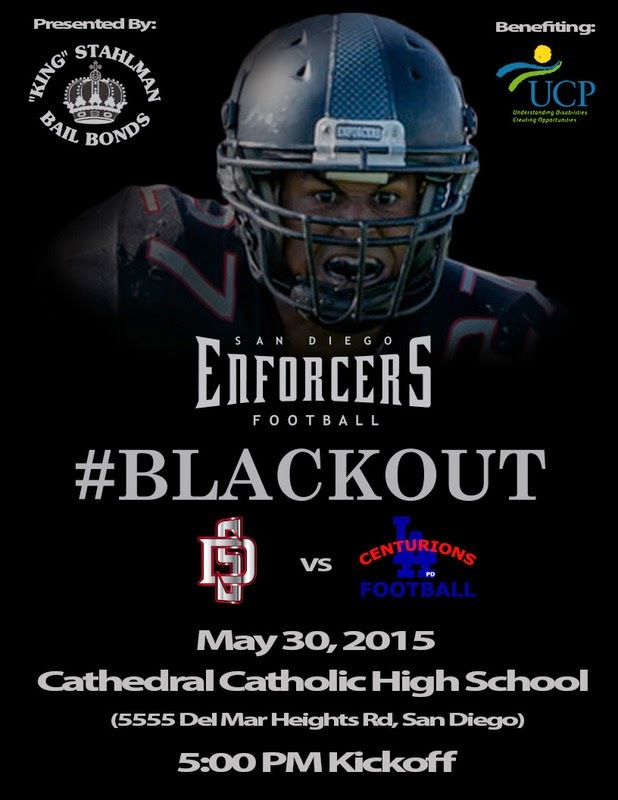 As a tribute to the significance of this game, the Enforcers labeled it a "blackout". 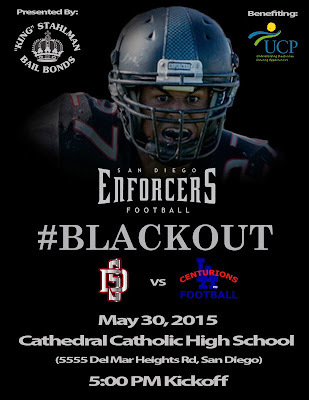 Players and coaches will be sporting all black attire, and fans in attendance are encouraged to do the same. "It just epitomizes what a rivalry is all about, " Salmon added. "They have a great organization, we have a great organization, and I'm really excited about what's going to happen on Saturday." With 14 touchdown passes and just one interception thrown, veteran quarterback JJ Carrell is having an outstanding season. In Salmon's opinion, it's his best season ever as an Enforcer. "JJ is one of the players who puts more time and effort into watching film, and understanding his opponent," Salmon said. "He just seems to get better with age." Like any other humble player, Carrell gives most of the credit to his teammates and coaching staff. "No matter how good you may think that you are, you're only as good as the guys around you," Carrell said after praising his offensive line, receivers, and coaches. "I'm enjoying a better year and it all comes down to this game."